Mountain Dew is going back to a throwback from the ‘90s by returning to its hottest slogan for its new cold beverage advertising campaign. Consumers will recall the popular “Do the Dew” marketing slogan when Mountain Dew launches its very first global marketing campaign next week, which happens to coincide with the slogan’s 20th anniversary. While the updated campaign will once again feature extreme sports stars to appeal to the male Millennials who make up its target market, company executives say that the slogan is now more about enjoying the moment than engaging in extreme stunts. The Wall Street Journal offered a sneak peek of what Mountain Dew will do with its marketing this time. 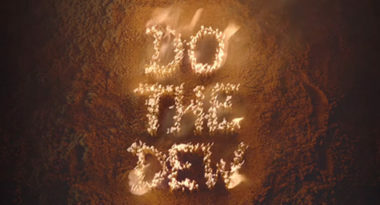 The new “Do the Dew” campaign will feature two spots directed by Hollywood director Justin Lin that will air both on TV and online. The first spot titled “Fireboard” will follow professional skateboarder Sean Malto as he begins a beach bonfire. The second spot called “Directions” will showcase Olympic snowboarder Scotty Lago as he sleekly glides down a snowy mountain to land at a party. The overall marketing mix of the campaign will 55% television and 45% digital, but these efforts will extend to print, out-of-home, and other digital content. This new campaign will appear in almost every market that sells Mountain Dew, including the U.S., Canada, Latin America, Western Europe, the Middle East, India, and Asia Pacific. Mountain Dew is one of PepsiCo Inc.’s fastest-growing brands, so the company is striving to leverage this leading brand to gain global marketing share and challenge the recent trend toward more health-oriented beverages. The company chose to position this marketing campaign globally because while the company expects to expand beverage sales in North America, most of their growth will come from outside of the U.S.
“We have a strong commitment to building our top global billion-dollar brands—of which Mountain Dew is one of those—and really strengthening the equity of those brands such that they can command pricing power in the marketplace and so that they have a very strong foundation for innovation,” said Brad Jakeman, president of PepsiCo’s global beverages group. Discover strategies for successful marketing campaigns. Contact MDG Advertising. MDG Advertising is a full-service advertising agency and one of Florida’s top branding firms. With offices in Boca Raton and New York City, MDG’s core capabilities include branding, logo design, print advertising, digital marketing, mobile advertising, email marketing, media planning and buying, TV and radio, outdoor advertising, newspaper advertising, video marketing, retail marketing, Web design and development, content marketing, social media marketing, and SEO. To discover the latest trends in advertising and branding, contact MDG Advertising.